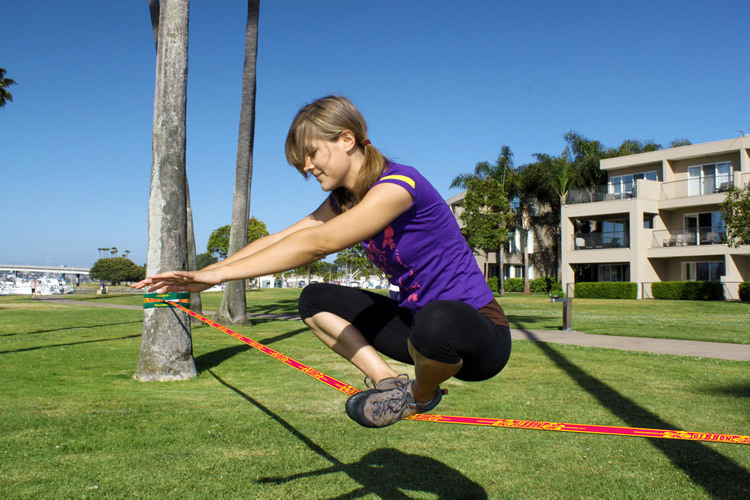 The Gibbon Ladies Line is a slackline designed specifically for women. It is lightweight, compact and very easy to use, perfect for all kinds of static poses, fitness and yoga. Also nicely colored and not expensive. Note: The video actually features the Gibbon Travelline, however color is the only difference between these two lines. Lightweight and compact, it is an ideal fitness tool. The webbing offers a soft, elastic feel and is perfect for all kinds of static poses and yoga. Plus the rubberized prints on the line will help you achieve better contact and keep balance. 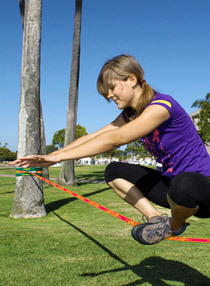 On the other hand, the Ladies Slackline is not designed for jumps and bouncing tricks – the stretchy webbing does not provide enough tension to throw you in the air and also the ratchet is not that robust and can malfunction in such case. So for these kinds of stunts, we would rather recommend you the Jibline. 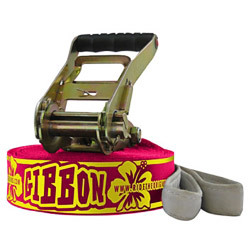 Quick and easy setup is one of the biggest advantages of Gibbon slackline kits. The line consist of just two parts and all you have to do is join them together with the ratchet – which won't take you more than a few minutes (watch the video below). Conclusion: If you are looking for some new fitness challenge – or want to take yoga exercises into an entirely new level, we can definitely recommend the Ladies Line to you. It's comfortable to walk, very easy to set-up and not expensive. However, if you are not interested in these activities (or want to add some more to the mix, for example jumping tricks), there are slacklines that.will suit you better – so please read our guide how to choose the right one for you.